You Can Heal Your Heart. 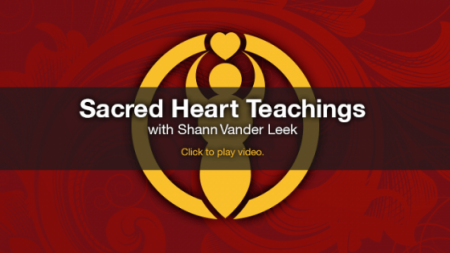 Sacred Heart Teachings Digital Program. Beneath our personal stories of pain and discomfort, we can access wholeness, love and compassion. If you want to wake up each day feeling good about yourself. Energized. Happy. Peaceful. If you’re ready to shed the layers of protective armor wrapped around your heart, this supportive digital body of work is for you. You can trade in the weight of guilt & shame for self-acceptance. You can break free of the painful experiences of your past. You can learn to silence your inner critic. You can put your energy where your joy is. No matter what has transpired before this moment. No matter how much time you have spent stuck in the past or endured a prison cell of critical self-judgment, you are loved. You come from great love. So how would it be possible that you could be anything other than the embodiment of LOVE? I invite you to forgive yourself and can show you how to let go of what no longer serves you. If you are willing to look closely at your emotions, attitude, and behaviors; you will be rewarded for your sacred work. Welcome to The Sacred Heart Teachings. I created this digital program to help you heal your past and open your heart so you can experience more joy. Let me show you how to do the inner work necessary to begin your healing journey. Most personal development offerings focus on a single area of life that you wish to improve. Wealth, health, relationships, confidence, work-life-balance etc. Self-growth is awesome. Unfortunately, many self-improvement programs fail to provide a holistic approach to your precious well-being. The Sacred Heart Teachings Program is different. The purpose of the Sacred Heart Teachings is to guide you to do the introspective work you need to do so you can EXPERIENCE MORE JOY. When each one of us heals ourselves, we invite a profound shift in compassion for ourselves and the world. When you experience compassion and trust, you feel whole. You’re at home in your body, and you enjoy a healthy relationship with yourself and others. You will discover how to recognize (and end) patterns of self-abuse and self-sabotage. You will learn to uncover shame and let go of what no longer serves you. You will open to yourself, wipe the mirror clean and celebrate the truth of your divinity. a powerful multimedia digital program. 4 months of email to support you on your transformational journey. You will receive the first email a week after your purchase to give you some time to acquaint yourself with this supportive material. Listen to How the Sacred Heart Teachings program came to life. This body of work began about twelve years ago when my daughter was a toddler. A sacred knowing or astuteness accompanies the first foray into motherhood. Being a healthy mama for my precious child became the catalyst for my sacred healing and lifestyle transformation. Once focused only on my career aspirations, I lost interest in and respect for my feminine strengths. Always a fierce warrior, I lost myself in the predominately male culture in which I was immersed and was still trying to get validation from my father. I was completely closed off to my Divine Femininity. The real me was hiding out like a child under a coffee table. My heart was encased in layers of protective armor. It never occurred to me to flaunt being the bright, soulful and funny woman (I now know), I am. Thankfully, I found the courage to leave the job that was killing my soul and let go of people, places, and behaviors that no longer served me well; including stepping away from an unhealthy relationship with my father for a significant amount of time. I was open to learning how to create more balance in my life. Yoga helped me lower my stress levels, find my truth and navigate through an enormous transformation. In the years I’ve been interested in, studying, and currently teaching Luscious Living Yoga playshops; I’ve reinvented myself and opened my big beautiful heart. Coaching, journaling, practicing Yoga, listening to guided relaxations, receiving regular bodywork, and igniting my creativity, dramatically improved my relationship with myself and others. I left my job and leaped into my new business. I finally learned how to access the peace and tranquility I’d sought for so long. My personal discovery and sacred heart healing experiences led me to create this program for you. You will be calling up memories. You will learn more about yourself. You will get in touch with your feelings. You will experience creative exercises to unite your mind, body, and spirit. You can expect to experience extraordinary breakthroughs when you combine deep introspection with yoga and guided relaxations. You learn to rest, unwind and recover. The Sacred Heart Teachings program isn’t a quick fix or a line of B.S. to make you feel better. I will not offer you a bandage for the part of your heart that is wounded. What you will get is my personal method to heal your past, free your heart and see yourself through the eyes of your divinity. This is soulful work. This is the kind of self-inquiry and energetic shift that deserves reflection and recovery. You deserve time for deep introspection. You deserve to honor your body with compassionate self-care. You deserve to face yourself and remove your mask of folly. techniques to heal your past and open your heart. how shame and suffering keep you from connecting with your divinity. how you can put your energy where your joy is. 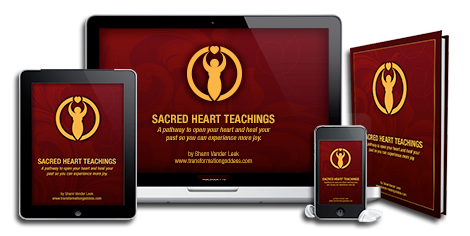 where you are in the Sacred Heart Healing Cycle to better understand the feelings you may be experiencing. Make a commitment to heal your heart and rediscover your magnificent Self. Let go of guilt and shame. Get to the root of what is making you feel bad. Forgive yourself and everyone who’s ever done you any harm. Gently learn to move your body and relax your mind. the Sacred Heart Teachings today.